Of Cypriot origin, Mavroides was self-taught as an artist. He combined in his work Expressionist and Abstract elements. His works in the A. G. Leventis Foundation Collection have a variety of subjects ¬– portraits, landscapes, still lifes and nudes – made with diverse media (oil, watercolour, tempera, gouache, mixed media).The Girl in White Shirt (1949) and Women-Wasps (1959) are ten years apart: from the expressive woman’s face, with dark-brown eyes, rendered in visible brushstrokes against an undefined background with angular shapes in the former, Mavroides gradually shifted towards an abstractive language and formed an expressionistic vocabulary; the later work has vivid colours and black in bold combinations in larger surfaces, with broader brushwork, freely conveying the figures, whose main features, although heavily distorted, remain recognisable. After studying law and political science at the University of Athens, he joined the Greek diplomatic corps in 1946. Living in Paris (1950-1952), he became acquainted with European painting. In 1959 he became a professor at the Athens School of Fine Arts, where he taught until 1982, serving as the school’s director (1975-1977) and first dean (1977-1978). Already before abandoning his diplomatic career, he became a founding member of the ‘Armos’ group of artists (1948). 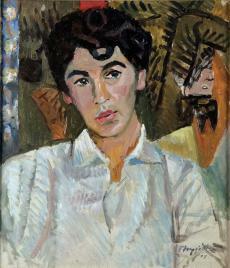 He participated in the Biennales of Sao Paulo (1955, 1957), Alexandria (1961) and Venice (1966). He made a colour relief for the Mont Parnes Hotel (1959-1961). He received the Excellence in Arts and Letters Award of the Republic of Cyprus and the Excellence in Arts and Letters award of the Academy of Athens (1995). He also pursued sculpture. 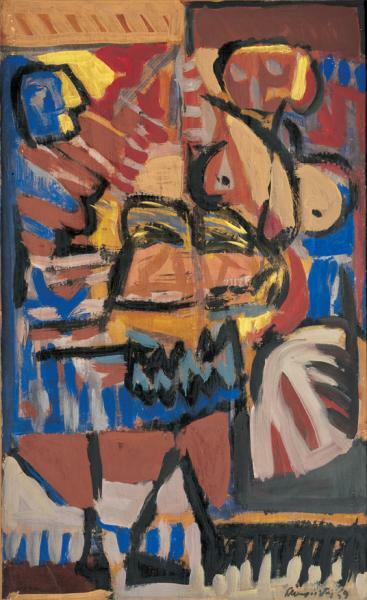 A self-taught artist, he combined in his work Expressionist and Abstract elements.